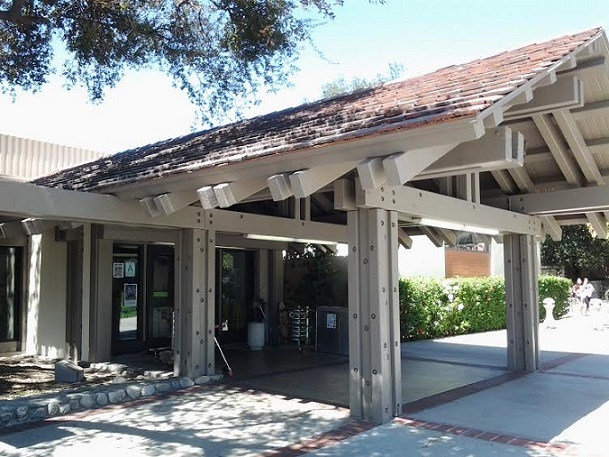 I’ve made a slow circuit of the dining halls of the Claremont Colleges, hitting Claremont McKenna, Harvey Mudd, Pitzer and Scripps over the past few years. Since they’re open to the public, they’re fair game for a Restaurant of the Week. 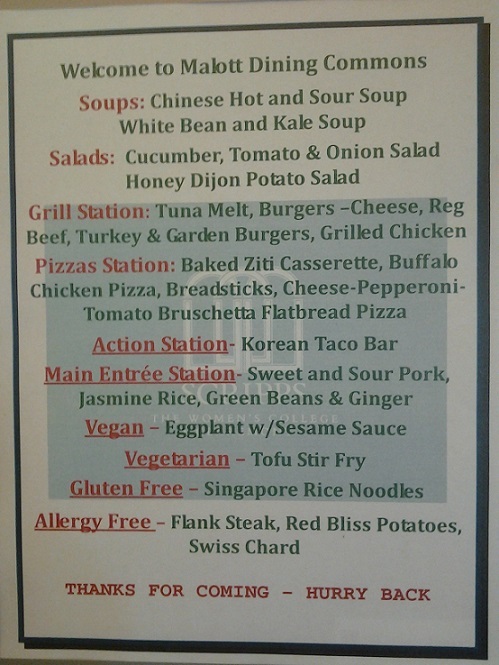 The food at all the above is pretty good and varied too, with potentially more vegetarian and vegan options than many restaurants, thanks to the ethical, philosophical and gastronomic attitudes of the college population. And the chance to mix in a collegiate environment may be a nostalgic experience for post-collegians. The dining is almost certainly better than you remembered. 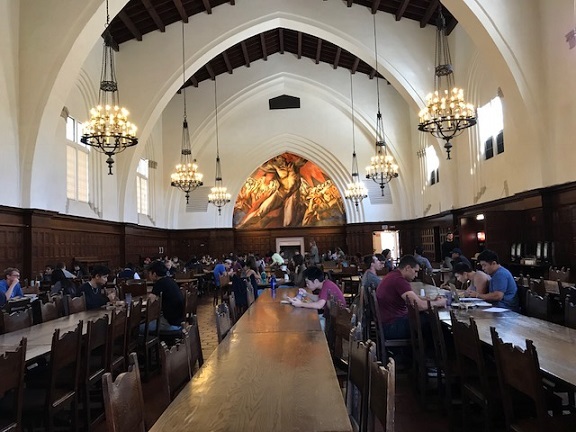 Pomona College’s Frary Hall (hours and menus here) is the granddaddy of the dining halls, opened as it was in 1929. 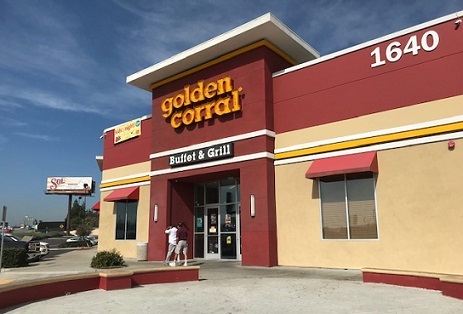 I went there for lunch recently with two friends, one of them a colleges employee. The environment is the best of the dining halls, a grand space with cream walls, dark wood and a soaring, arched ceiling. It’s the Hogwarts of the Inland Valley. (A Potter fan might really like a meal here.) And you get to see the “Prometheus” mural by Jose Clemente Orozco. My friend said Frary has the worst food of all the colleges. 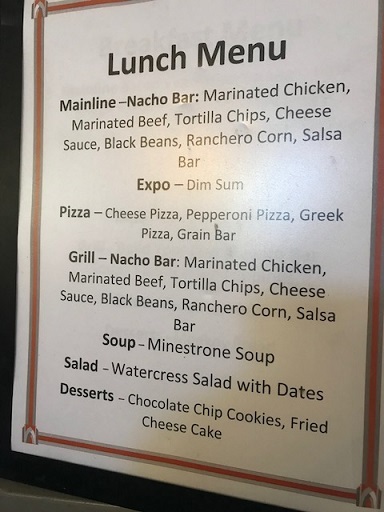 And the choices that day did not inspire: not one but two nacho bars (if there was a difference, we failed to discern it), pizza and dim sum. Meanwhile, over at Pitzer, they were feasting on blackened pork loin with nectarine avocado salsa and broccoli. 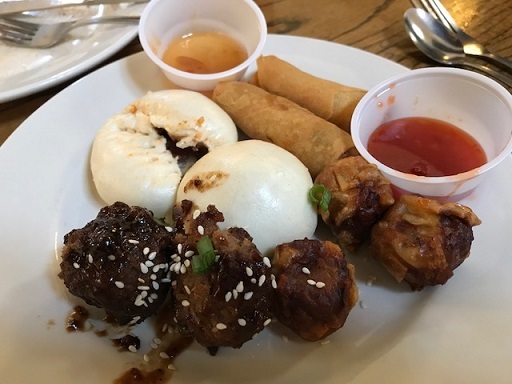 We had nachos and dim sum, which consisted of vegetable spring rolls, pork siew mai, cha su bao and meatless Hoisin meatballs, with three dipping sauces. 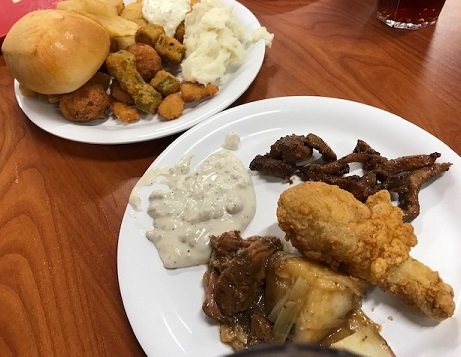 Still, for $14 for a visitor, the price for an all-you-can-eat buffet is all right, and the quality beats the inedible Hometown Buffet by a mile. But Frary might be due for an upgrade. 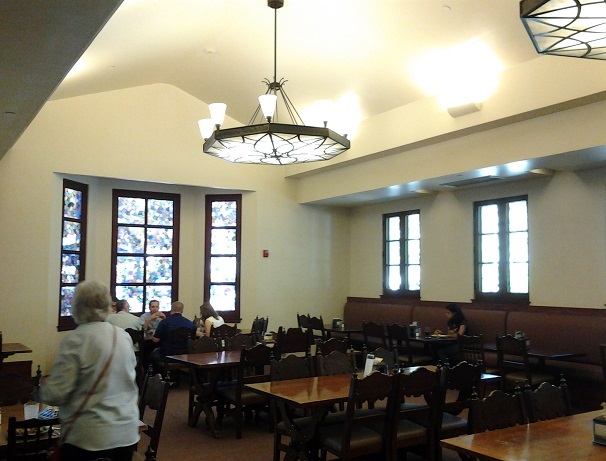 I’ve previously posted about Scripps and Pitzer’s cafeterias and have eaten at Pomona’s, pre-blog. Recently I scheduled a lunch at CMC’s cafeteria with a campus friend, my first meal there. Describing where things are on a college campus isn’t easy, but we entered on foot at Mills and Sixth, northwest corner, followed a path a few yards northwest and were soon there. You pay upon entering: $13 if you’re on your own, $7.50 if you’re the guest of someone on campus. The choices are almost dizzying. There are six stations: @Home, Farm to Fork, Expo & Options, Grill, Stocks and Ovens. That means, respectively, American comfort food, vegan, ethnic, burgers, soups and pizzas. I opted for @Home in part because there was no line, unlike Expo and Grill, getting a pork chop with mashed potatoes and vegetables, plus a salad with some fruit. My friend, who’s vegetarian, got roasted pepper hummus, a tomato salad and basmati rice. Even the beverage station was an ode to plenty. I bypassed the sodas, vitamin waters and tea to get a strawberry lemonade, and then kicked myself for not seeing the two aguas frescas. 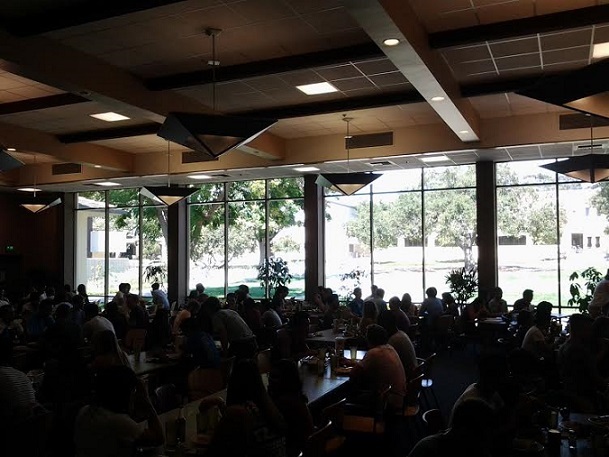 The dining room, while crowded, was also lovely, with floor to ceiling windows looking out over the campus and providing lots of natural light. When we left, the cafeteria was mostly shut down (they close between meals) and the soft-serve ice cream machine was already shut off, darn the luck. They still had two kinds of cookies, two kinds of cake and one kind of cupcake. I took a chocolate chip cookie. It was dry and quickly abandoned. It was the only disappointing part of the meal. So, it’s a cafeteria, and it’s cafeteria food, but probably not like anything you remember. 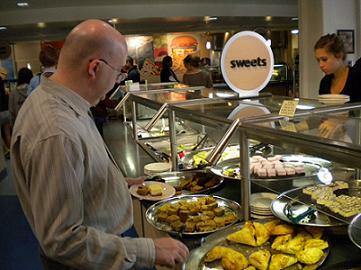 Like Claremont’s other dining halls, Collins rivals any buffet in the area. 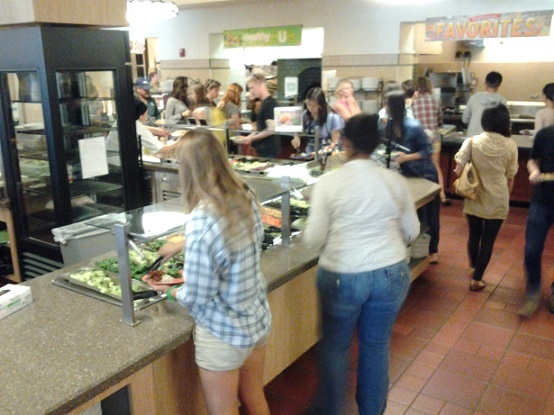 Regulars can tell you the idiosyncracies of each college dining hall. I’ve had lunch at most of them and have yet to be disappointed. The offerings change daily. Here’s a link to the Pitzer site; note the limited hours. 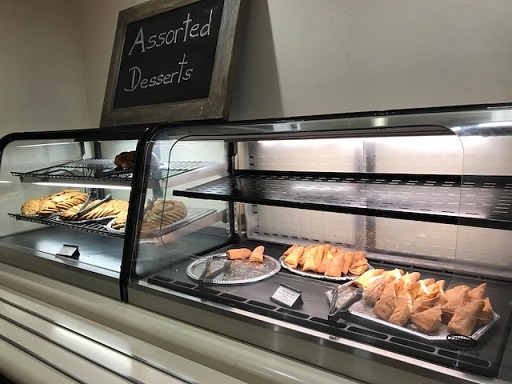 At Pitzer one recent day, they had a couple of soups, salad and dessert bars, stations for hot or cold sandwiches, chicken teriyaki breast, a gourmet pizza (with pear as the topping) and a pasta. There was fresh fruit, breakfast cereal dispensers, frozen yogurt and undoubtedly more that I’ve forgotten. 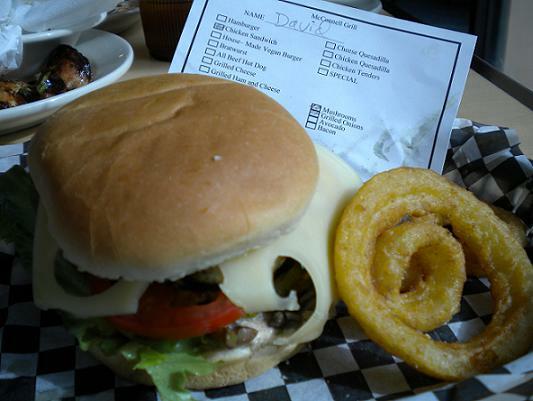 The made-to-order chicken sandwich, pictured above, had Swiss, mushrooms, grilled onions, lettuce and tomato. Good stuff, as was the pizza and the soup. As you can see in the second photo, there was no shortage of cookies, brownies, pastries and other sweets for an indecisive blogger to choose from. The only downside is finding legal parking. Especially with construction going on, spaces are hard to come by and most of them are marked for students and faculty only. To be safe, park on Claremont Boulevard or College Avenue and hoof it a few blocks. Here’s a link to a Pitzer map; McConnell Hall is No. 9, on 9th Street. 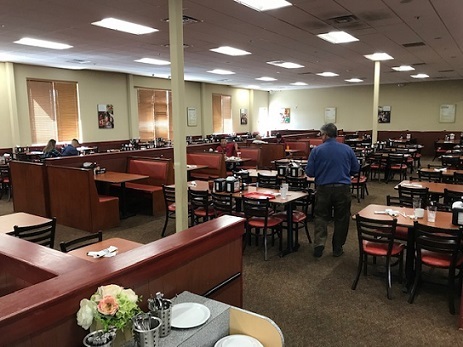 * The New Diner blog has posted a detailed review of McConnell with a clutch of photos. 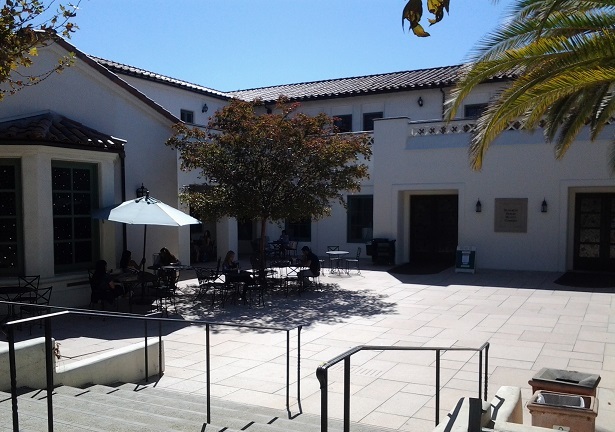 I was invited to lunch Thursday at Scripps by Judy Harvey Sahak of the college’s Denison Library. 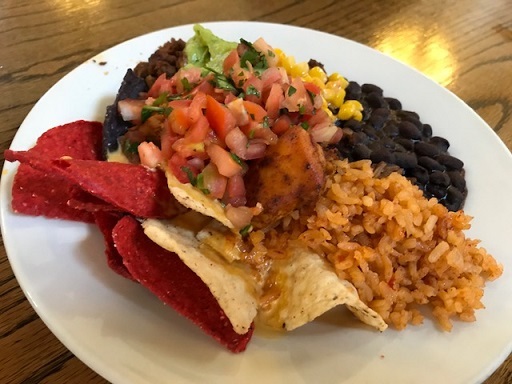 Claremont Colleges’ food won a deserved rave from a visitor and blogger from Occidental College. 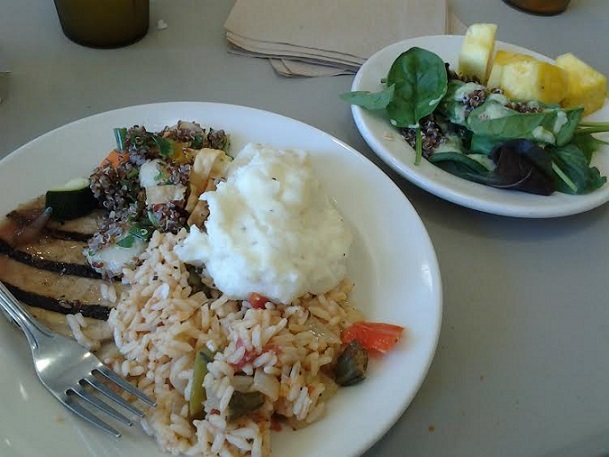 I ate last year at Pomona College’s Frary dining hall and was impressed. Harvey Sahak bragged that the Scripps food service is the best of any of the colleges and told me I had to try it. Well! It’s all you can eat, and I can’t even tell you all the stuff they had, they had so much. 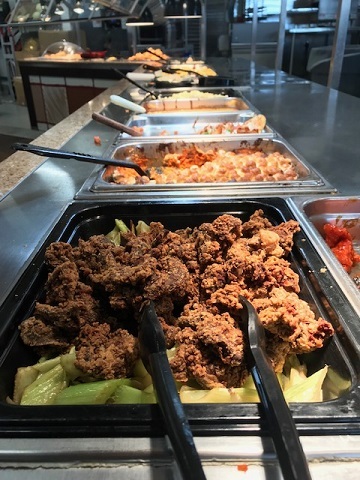 Let’s see: a good salad bar; four kinds of soup, including sourdough bread bowls; an array of gourmet-style hamburgers, deli sandwiches and paninis; four varieties of wood-fired pizza by the slice; a pasta dish called eggplant roll-a-tini; barbecued beef brisket and cornbread; meatball stromboli; and vegetarian dishes cooked to order. I had cream of asparagus soup, pizza with tomato, salad, meatball stromboli (a sandwich in a pita-like bread) and a slice of beef brisket. For dessert, frozen yogurt. Plus an iced tea. Harvey Sahak insisted on treating. Price is $5 for colleges folk and $7.50 for anyone else, not that anyone checks ID. 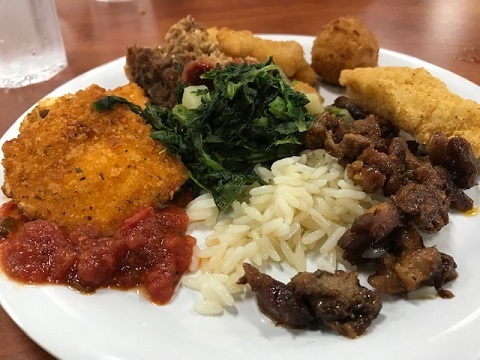 Anyone can eat at the college dining halls, and while they don’t exactly publicize that fact, they don’t discourage the public. Best dining deal in town. And the food is a long way from mac and cheese and mystery meat. In a satisfying boost for my ego, I was even recognized by a couple of readers, a college employee and her mom. All in all, a pleasant outing. * Update October 2014: More than six years after the above, I came back for lunch and photos. 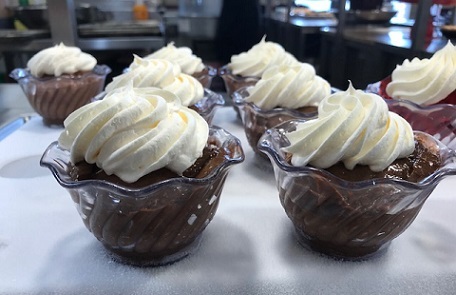 Malott has various stations to visit: a salad bar, Healthy U (vegetarian, vegan and allergy-free), Pizza and Stuff, Grille, Traditional Favorites, International, and Bakery and Desserts. Wow! See the day’s offerings below. 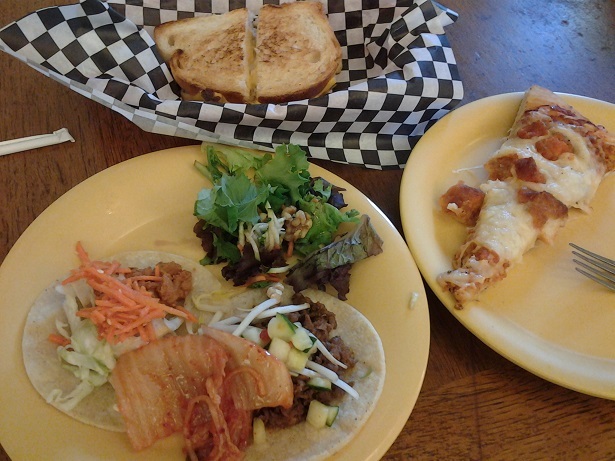 I had Korean tacos, both beef and tofu; kimchi; a slice of pizza; and a tuna melt; as well as some salad. For dessert, ice cream. Does life get much better than this? 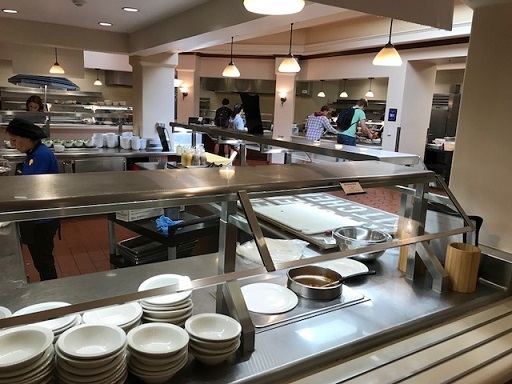 Although Scripps is a women’s college, anyone is allowed in the cafeteria, and “most of the CMC boys eat here,” I was advised. There are three small-ish dining rooms. One stately room, pictured at bottom, is unexpectedly nicknamed the Bikini Room because the stained glass patterns evidently form into a pattern resembling a woman in a two-piece, or maybe a series of women in a series of two-pieces. I couldn’t see a thing. I can never see Magic Eye pictures either.